Maneuvering the diverse and complex funding pipelines has become a significant challenge for even the most promising researcher, and poses a threat to the future of materials science in academia. 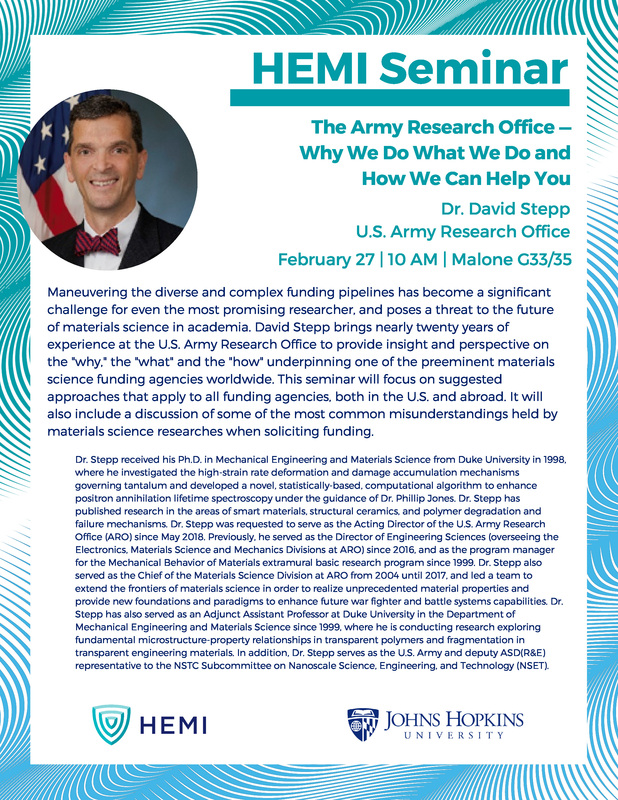 David Stepp brings nearly twenty years of experience at the U.S. Army Research Office to provide insight and perspective on the “why,” the “what” and the “how” underpinning one of the preeminent materials science funding agencies worldwide. This seminar will focus on suggested approaches that apply to all funding agencies, both in the U.S. and abroad. It will also include a discussion of some of the most common misunderstandings held by materials science researches when soliciting funding. Dr. Stepp received his Ph.D. in Mechanical Engineering and Materials Science from Duke University in 1998, where he investigated the high-strain rate deformation and damage accumulation mechanisms governing tantalum and developed a novel, statistically-based, computational algorithm to enhance positron annihilation lifetime spectroscopy under the guidance of Dr. Phillip Jones. Dr. Stepp has published research in the areas of smart materials, structural ceramics, and polymer degradation and failure mechanisms. Dr. Stepp was requested to serve as the Acting Director of the U.S. Army Research Office (ARO) since May 2018. Previously, he served as the Director of Engineering Sciences (overseeing the Electronics, Materials Science and Mechanics Divisions at ARO) since 2016, and as the program manager for the Mechanical Behavior of Materials extramural basic research program since 1999. Dr. Stepp also served as the Chief of the Materials Science Division at ARO from 2004 until 2017, and led a team to extend the frontiers of materials science in order to realize unprecedented material properties and provide new foundations and paradigms to enhance future war fighter and battle systems capabilities. Dr. Stepp has also served as an Adjunct Assistant Professor at Duke University in the Department of Mechanical Engineering and Materials Science since 1999, where he is conducting research exploring fundamental microstructure-property relationships in transparent polymers and fragmentation in transparent engineering materials. In addition, Dr. Stepp serves as the U.S. Army and deputy ASD(R&E) representative to the NSTC Subcommittee on Nanoscale Science, Engineering, and Technology (NSET).